If you live near San Francisco, you may want to consider enrolling in this UC Berkeley Extension course titled, "Navigating a Career Transition into the Life Sciences." Identify a career path in the life sciences and biotechnology sectors that best suits your interests, skill sets, and career goals. 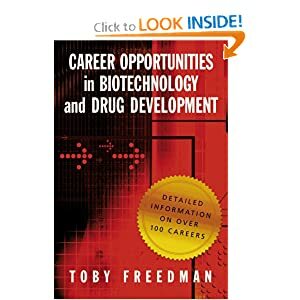 Through lectures, a self-assessment test, and discussion, develop an understanding of a variety of career paths in the life sciences, including sales and marketing, business development, clinical and regulatory affairs, project management, and discovery research. Get practical job search advice on topics such as working with recruiters, building your resume, networking, and interviewing. and Drug Development and owner of Synapsis Search, a life sciences recruiting company. She previously worked at an executive-retained search firm and in a biotechnology startup. She has a Ph.D. in molecular biology from the University of North Carolina-Chapel Hill. Click here to learn about the course.